Tis the season for cranberries! These berries are a good source of vitamins C and K. Mineral content includes magnesium, phosphorous, potassium and calcium. They also contain dietary fiber and different types of phytonutrients that can boost your immune system and more. It also has a low glycemic index load rating of 2! This little red fruit is a must for the holiday season. Many recipes call for white granulated sugar, but the sweetness of this recipe comes from all fruit juices. 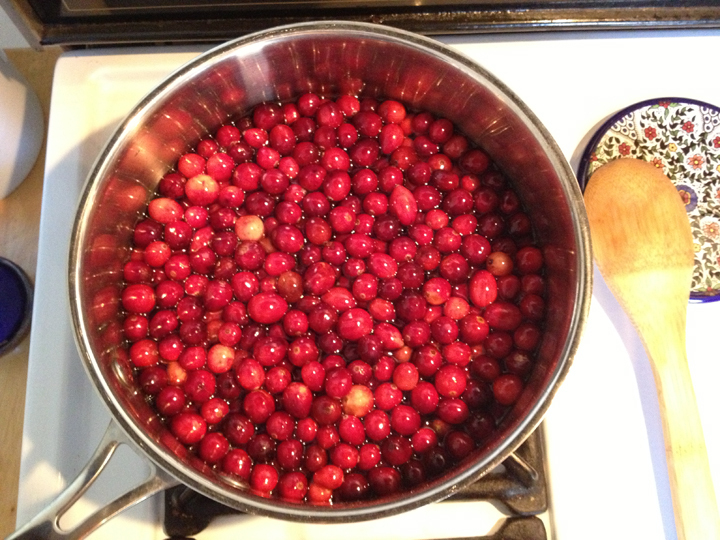 In medium a saucepot, combine cranberries, concentrated apple juice , water, cinnamon, and nutmeg. Over high heat, bring cranberry mixture to a boil; reduce heat to medium and add in orange juice, orange zest, and cook 10-12 minutes, or until cranberries have burst and the mixture has combined, stirring once in a while. In a small dish, mix your choice of flour with 1 tablespoon of water and mix vigorously until combined. Add the flour and water mixture into the saucepot and mix continuously until the sauce thickens. Simmer for 5-7 minutes or until it reaches the consistency you’d like. Remove the saucepot from heat and transfer to your favorite small serving bowl.